The first roundabout we encountered outside the Port of Bilbao proved something of a challenge. Just for the record, we went around it 10 times. Irishman pulled over and stopped the car. It was 7.30am and still dark. We were already bickering and we’d only been on Spanish soil for 10 minutes. He dragged his laptop out from the back, lit a cigarette and started flouncing about on the keyboard. ‘Here!’ he said shoving the laptop into my hands ‘at least one of us had the foresight to look the directions up on Google Maps first’ and with that he put his foot firmly back down on the accelerator and took the second turning on the right. For the first half hour of our journey, I kept very quiet. I was longing for a cup of coffee, and a pee, and I was also desperately trying to ignore the fact that every so often the car was omitting the strangest noise from beneath the bonnet. It sounded a bit like I imagine a turkey would sound if it were being throttled. If the noises were not disturbing enough, the car was also making strange juddering movements. I’d noticed both of these perculiarities on the way down to Portsmouth but was so caught up with my ‘on-road’ confessional that they were ignored. Not being able to bear the silence a moment longer I asked Irishman what he thought it was? ‘I’ve no idea, Lottie, why don’t we ask your father?’ at which point we both burst into fits of laughter. Two years previously I had lent my dad my car. What at the time had seemed like a marvellous idea, turned into something of a nightmare. A few weeks before moving to Indonesia, Irishman and I tied the knot; this meant my changing my name and address on all my documents. For some reason there must have been some confusion at the DVLA because when I handed the car over to dad, unbeknownst to me everything regarding it was still in my name. None of this would have mattered in the least if Ol’ Pops weren’t such a speed merchant. Within a week or so of being in possession of my car, he’d notched up one speeding ticket and by the end of the first 6 months he’d amassed another two. Because of the errors in the car’s paperwork, legally, I was the one responsible for these fines. Week after week, the Norfolk Constabulary had sent reminders to our London address to pay the fines but as I was away on the other side of the world, I was blissfully unaware as to the mountain of paperwork that was meanwhile building up on the doormat at home. To cut a very long story short, one year later I had to go to the Magistrates court in London and explain myself. I was given a £600 fine, my driving license was taken away and then when I later appealed to have it returned, I found that I had 6 points on it. The moral of this story is, if you lend you car to anyone, make sure you double check that all the i’s are dotted and all the T’s crossed. But finding myself on the wrong side of the law wasn’t the end of it. Dad was clearly not just a boy racer; he’s also become an unspeakably bad driver. When the car was dropped back in London shortly after we arrived back from Jakarta, there were untold scrapes, scratches and dents all over it. The front bumper had become a veritable kaleidoscope of colours, and the entire trim on one side of the car had vanished! In lieu of my lovely black Citroen, dad had returned a stock car with a turkey wrapped round the engine. We drove for a couple of hours; firstly through the drizzle and wet of the mountainous Basque country and then down through Rioja towards Madrid. According to Google Maps it was going to take us between 7.5 and 8hours to get to Granada, a distance of nearly 850 kilometres. Every so often the turkey let out a loud screech and the car would start to judder and hop. We could only pray that we wouldn’t breakdown. Our budget certainly didn’t stretch to a night in a hotel or costs for getting the car fixed. We stopped at a motorway service station, downed some strong coffee and gorged on fat slices of delicious tortilla before hitting the road once more. By 1pm we were circumnavigating Madrid and we both whooped with delight when at last we saw signs for Cordoba and Granada. It was at this stage the enormity of setting up home in a new country really started to sink in. In the space of 5 days, we’d gone from living in Indonesia, to now embarking on a whole new adventure with little money, no paid work and only our enthusiasm and faith to really keep us afloat. Irishman hadn’t seen the house and in truth I had only seen it once on a gloriously sunny day in August. We had no furniture with us in the car, just a tiny gas camping stove, a kettle, a saucepan, some mugs a few clothes and some bedding. I hoped beyond hope that Antonio, who we had bought the house from, had remembered to leave some of his brother’s furniture behind. There was an old brass bed and a sofa and some chairs that he’d kindly agreed to leave them for us if we wanted them, I prayed that he’d not forgotten. Leaving Madrid behind us we then drove through the heart of Castilla-La Mancha made famous by Cervantes with his stories of Don Quixote. The land is much flatter here, with only the occasional ridge of hills to break the landscape. I spotted a shepherd walking his flock of sheep through the golden autumn fields, a donkey by his side. On and on we traveled until at last the road forked south of Bailen. We took the road signposted to Granada and just before Jaen, the countryside started to change dramatically. Suddenly the hills became mountains and the motorway cuts its way through the rocky passes. Every so often we’d drive through a tunnel, some of which were at least 2 or more kilometres long, an amazing feat of engineering that when built must have shaved hours of the driving time between Madrid and the South. At last it was time to turn off the motorway. Irishman and I were both exhausted, it had been a tiring few days and now we just wanted to get home. An hour later we were on the approach to the village. It was late in the afternoon and the olive groves were bathed in the last glow of a warm, sunny day. I fished a piece of paper out of my pocket on which I had cobbled together some greetings and phrases in Spanish. The estate agents had left the keys for our house with our new neighbours, Paco and Antonia. Rather conveniently, Paco and Antonia also happen to own the bar and the village shop. We pulled up outside the bar. On the low wall opposite, like swallows on a telegraph wire, sat four old men chatting. As soon they saw us, they stopped their conversation and turned to stare. Suddenly all eyes were on us. We greeted them in unison with our finest Spanish ‘OH-LAR!’ before swiftly diving into the bar for some Dutch courage and our keys. I’m loving your latest adventures Lottie!! Thanks for keeping the posts going 🙂 Buena suerte! They did indeed AV – more OH LARS on the way…. Lottie you just keep better and better. I don’t know where your talent comes from but I believe it is a natiural ability to see beyond the ordinary and you know how to tell a story as if you are speaking to your fans/readers individually. Since you are a people watcher that also helps. Of course, that old cliche of waiting with bated breath applies here. I did not want the story of your arrival to end. And you know what? You know how to hook a reader and leave them hanging high and dry, waiting for more. Your motto should be, “hook-em and reel-um slowly. I laughed again and thought how appro that the neighbors are the local bar keepers. I wonder if any villagers make and sell wine. Hello Yvonne, thank you for the age assumption, not the case sadly. My occasional travels have not yet taken me to Spain, so the question was genuine. I grew up on a farm in New Zealand and the equivalent beasts here can, shall we say, ‘pack’. That was a cruel place to stop. I think you must have been fed a diet of Saturday cinema with it’s weekly installments as a child, it always ended with the hero about to be crushed or something and having to hang there for a week. Is it now going to take a week for you to get from the bar to your new front door and the Irishman’s reactions to the new home? What a story. I was all knotted up and can just imagine how the trip went. Can’ wait for the next chapter. How did Irish go entering the front door? What were his reactions? Was there a bed? Don Q would be so proud of you. Never a dull tale :). I can’t believe what happened to your car and can only imagine the trail of destruction your father must have left in his wake! I hate to think about it! Those poor peeps whose cars he’s scraped? 100’s of them….a trail of destruction indeed! A great yarn and just the beginning of many more chapters of your life in Spain. Like the others I can’t wait to read more of ‘the arrival’. Assuming that is you made it out of the bar! 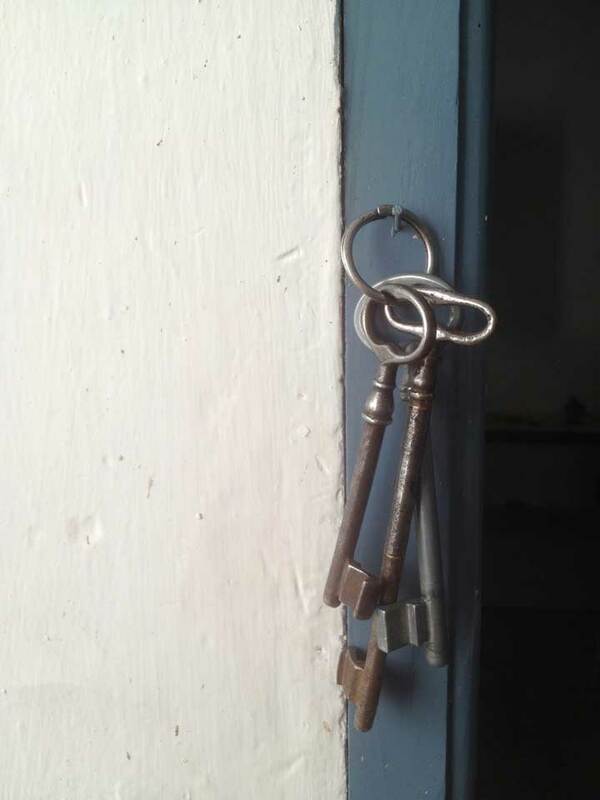 I love the photo of the keys – they were left hanging just as we – very clever imagery. Thank you, Rod. I hadn’t thought of it like that but now you mention it….There will be lots of photos in the future posts, I was a bit stuck for ‘illustrative’ pics for these first two as I took very few photos on the boat and only a couple on the way down but there will be lots of colour soon! I’m so glad that you are enjoying the yarns! You’re a magnificent story-teller! Can’t wait for the next installment! What high praise! thank you, dear Sherry. Lottie, using a map is cheating. You should navigate by instinct. And don’t use GPS. I tried to use the GPS in a hire car to find the cemetery where my mother is buried – it took us to a fish and chip shop. Your father sounds a great man. I assume he liked his cars to be in British racing green and modelled himself on Stirling Moss? Or Hunt the Shunt? £600 is ok (sort of) but losing the licence – that’s really rather harsh. I hope the car survives a bit longer. Do they have the idea of an MOT in Spain? I think the main thing is that you got there in one piece and the dream is still alive. I remember driving off the ferry at Dover many years ago after driving in Germany for 4 years. I went the wrong way round a roundabout. Force of habit. Luckily it was about 5am and nobody saw me. I hope you and Pedro are very happy in your new bucket. I mean home. I’ve never had any joy with Sat Navs but I have a lot of joy with my Sat Nev – he’s pretty good at finding his way from A-B. I hope you did manage to find your mother’s grave? I know that I wouldn’t have managed to resist the fish and chips, I’d have had to have gone in and bought some before chucking the hopeless GPS out of the car window. Dad’s driving! oh dear! My brother told me about an occasion that they were in a multi-storey car park together, I cringed, I could hardly bear to hear about it! He’s not really like Stirling Moss, the joke is that he was only doing something like 4 mph over the speed limit – almost makes it worse! Yeh! Good old dad! In his defence, he did leave the inside of the car a lot cleaner and tidier than when I handed it over to him. Our house key are something of a joke, they are so huge that it really would be quite difficult to mislay them! Thanks for the link 😀 hahaha about the bottle bin…..which reminds me, time to take more empties out there…..!